Social commerce network Lockerz is opening its up the site to non-members. As you may know, Kleiner Perkins-backed Lockerz, which just raised another $36 million from Live Nation, Dag Ventures, Kleiner, and Liberty Media; revolves around the idea that influencers within a social network can become brand and content advocates and affect the behavior of their friends. Lockerz is primarily targeted towards men and women ages 13 to 30, and is attempting to create a community of trendsetters and tastemakers who love to shop, play and connect on the Web. Users can earn points and discounts on brands by sharing content on the site. The company wants to be the go-to commerce homepage for teens and young adults. Now for the first time, Lockerz is open to non-members for exploration (users previously had to create a profile to peruse the site). Visitors can check out the company’s “Dealz” section, which includes thousands of special offers daily on everything from fashion brands, to restaurant and sporting events. Customers are still required to join Lockerz in order to earn the network’s virtual currency PTZ, which can be redeemed for shopping discounts. Lockerz members earn PTZ for nearly everything they do on the site, including logging in, uploading photos, viewing videos and buying merchandise. Lockerz says it is seeing 45 million monthly unique visitors (according to Google Analytics), although comScore reports 13.5 million monthly unique visitors worldwide in June. But across all the data reports, Lockerz is growing in terms of visitors. Opening up the site is surely a way to increase traffic. The company also acquired photo sharing app Plixi as a way to boost photo sharing on its platform back in January. Lockerz also recently bought social sharing platform AddToAny last month. 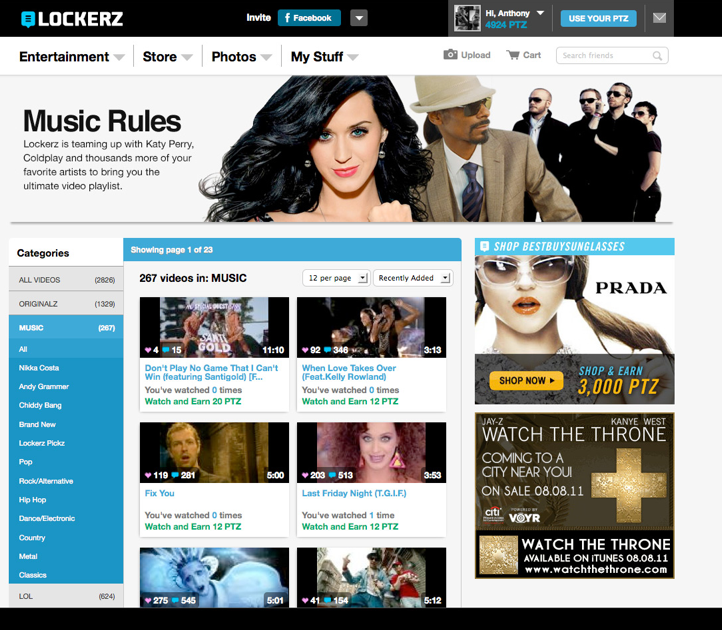 In addition to the opening up of the site, the Lockerz homepage has also gone through a redesign, and and the company has announced a partnership with EMI Music, in which videos of recording artists from record label’s library are available on Lockerz. Anyone can view the videos, but only members will earn PTZ for watching. Considering that Live Nation just joined Lockerz as an investor, it should be interesting to see if the network can build traction around sharing music (and perhaps replacing MySpace in that category? ).